iPhone video converter is designed for millions of iPhone fans . It can convert to iPhone playable format from various iphone files with super fast speed. 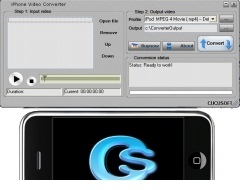 iphone video converter can convert all videos like FLV, DivX, XviD, MOV, RM, RMVB,dvr-ms, MPEG, WMV, AVI to iPhone readable format . Below is some iPone video converter software , you may You can selectively according to the needs of you download it . PQ iPhone Video Converter is a One-Click solution to convert Tivo, DivX/Xvid movies, MPEG, WMV, AVI, RealMedia videos and many more to iPhone/iPod Video in high quality. 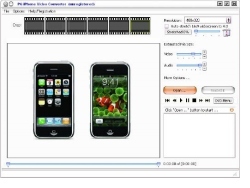 Avex iPhone Video Converter converts AVI, DivX/Xvid, WMV, MPEG videos (and many more) to iPhone MP4 video format in one simple click. Adjustable video size for playback on iPhone and on TV screen as well. 4Media iPhone Video Converter for Mac, a faultless iPhone video converter, can convert all popular audio and video files, such as AVI, MPEG, WMV, MP4, VOB, AAC, AC3, MP3, to the formats supported by iPhone/ iPod including MP4, M4A, MP3 etc. 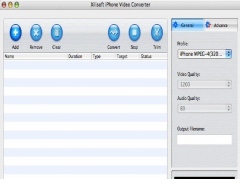 Xilisoft iPhone Video Converter for Mac is a perfect iPhone video converter, which help you convert all popular videos and audios to iPhone, iPod supported video and audio formats easily.